Florida repeats as National Champions! The Florida Gators took a chomp out of NCAA history with the repeat they simply had to have.Now they want more. They want to be called one of the best teams of all time. The Gators made their case Monday night with an 84-75 victory over Ohio State to capture the second straight national championship that was their only reasonable goal this season. They became the first team to go back-to-back since Duke in 1992 and the first ever to repeat with the same starting five. While the debate about the best teams of all time can truly begin, there is no denying that Florida’s overall athletic program is the best in the nation. This win completes a 2007 championship-game sweep of the Buckeyes in the two biggest college sports — men’s hoops and football. Florida, a 41-14 winner in the football title game in January, remains the only program in history to hold both championships at the same time. The celebration looked much the same as last year. Lots of jersey tugging, jumping onto press row and Joakim Noah running into the stands to hug it out with loved ones. Donovan added another gold star to his resume, which figures to command more than his current $1.7 million next season, whether he returns to Florida or bolts for a possible job offer at Kentucky. His job this season was hardly just a matter of rolling the ball out there. He had to keep everyone motivated and focused — at first when things seemed too easy, then later when the Gators lost three of four toward the end of the regular season. They finished with a 10-game winning streak and haven’t lost a postseason game in 18 tries, counting sweeps at the Southeastern Conference tournaments the last two years. Lewis probably shouldn’t have gone there. All season — including in the 86-60 victory over Ohio State in December — the Gators have morphed into whatever kind of team they needed to be to win, and this one was no different. Stopping Oden figured to be the key, but really it was more complex than that. The 7-foot freshman, who may be one-year-and-done with the NBA beckoning, stayed out of foul trouble and played 38 minutes — just what the Buckeyes figured they needed to have a chance. Florida’s focus, however, was more on stopping the rest of the team. Oden drew mostly single coverage when the ball went into the post. Donovan played a lot of zone and mixed his big men in and out. Horford, Richard and Noah all took turns, and 6-10 freshman Marreese Speights was added to the mix to give Florida five more fouls to play with. Oden had to work for his points and Ohio State couldn’t take advantage of any other matchups, especially on the perimeter. Ivan Harris was the only Buckeye to make a 3-pointer over the first 39-plus minutes of the game, and he finished 2-for-8. Mike Conley Jr. finished with 20 points for Ohio State, but lots of them came late after the Buckeyes were playing big-time catch-up. Meanwhile, one thing Florida has always been able to do is shoot the ball — a nation-leading 53 percent this year — and Monday night was no exception. The Gators went 10-for-18 from 3-point range. And Florida also had quicker hands. How frustrating it must have been for Ohio State to watch Oden block shot after shot, only to see the Gators grab the rebound and feed back out to Lee Humphrey for a 3. That happened twice in the second half, both times when an Oden block looked like it might spark Ohio State, which kept the game in reach but couldn’t get the deficit below six. Green finished 3-for-3 from 3-point range and Humphrey was his usual killer self, going 4-for-7 and scoring 14 points. Florida’s versatility showed most in the first half when those two and Brewer (13 points) hit back-to-back-to-back 3s to push Florida’s lead to double digits. Horford had a monster game, bodying up with the 7-foot Oden on defense and more than holding his own on the other end. Those runners Matta was talking about — a bunch came from Horford, who spotted up and made three 15-plus-foot jumpers and twisted and turned for a few more hoops. Clearly, another year in college has helped this 6-10 junior, who now looks every bit like a lottery pick. Noah, on the other hand, probably sacrificed the most. He might have been the top pick had he left last season, but the presence of Oden and Kevin Durant, to say nothing of Noah’s dwindling stats, have pushed him down. He finished with eight points and three rebounds in this one, but big individual numbers were never the point with the Gators this year. They came back for the championship and anything less would have felt hollow. But there will be no regrets. Instead, how about a nice little debate about the best programs of all time? Repeats will almost certainly go down as a rarity in this age of one-year-and-done college players, and nobody in the last 15 years — even before the NBA money started skyrocketing — could do it anyway. There were, indeed, a few fans yelling: “One more year. One more year. One more year,” as the trophy presentation began. Nothing wrong with dreaming, right? 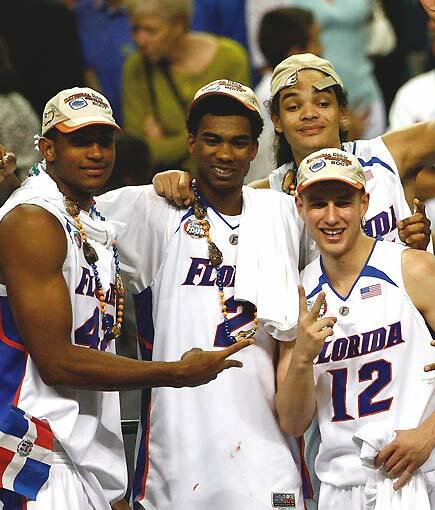 In a way, though, the Gators have already lived out their dream.